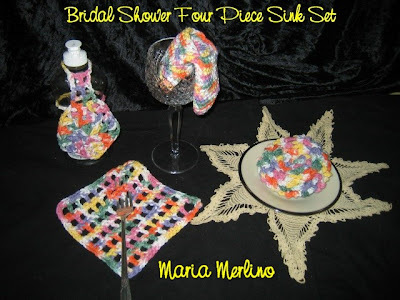 With only one skein of worsted cotton, you can make 4 different items for the bridal shower wishing well. I make mine in the order written and just had a few inches of yarn left. This is my original pattern and I have retained all my copyrights. 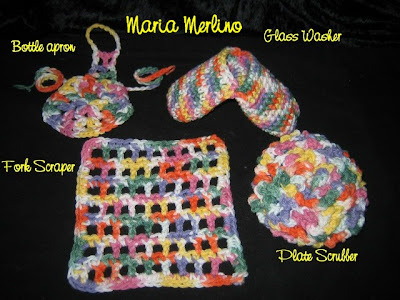 You may make items from the pattern for gifts. You may not sell either the pattern or items made. You may not profit from my work. Note: Piece is worked in a continuous spiral without joining. Rnd 1: Starting at the top edge of the mesh scrubber, and inserting hook somewhat horizontally and catching several plastic threads, ch 1, sc in same place, ch 3, now working evenly around scrubber (sc in scrubber, ch 3) 32 times. Rnd 2: Working toward the center in a spiral, , evenly work, (sc in scrubber, ch3) 24 times. Rnds 3-7: Continuing in pattern and working evenly, continue in the (sc in scrubber, ch3) pattern. Work front side only. Fasten off. Leave reverse side unworked. Rnd 15: Ch 10, skip each of next 10 sc, sc in each of 10 rem sc, sc in each of next 10 chs. (20 sc). You will now be working second pouch. Rnd 28: 2 sc tog around. (10) . Fasten off with a 4 inch length. With yarn needle, weave yarn length over and under stitches, pull tight to close and stitch shut. To use, insert thumb in one pouch and fingers in the other. Place finger side of pouch inside glass and thumb side of pouch outside glass. Row 1: Ch 21, dc in 3rd ch from hook, (ch 1, skip next ch, dc in next ch), across. (10 dc). Ch 1, Turn. Row 2: Sc in each dc and in each ch-1 sp. ( 19 sc) Ch 2, turn. Row 3: Dc in the first sc, (ch 1, skip next sc, dc in next sc), across. (10 dc). Ch 1, Turn. Row 4-14: Repeat row 2 and row 3, alternately, with row 14 a sc row and not turning at end of row but continuing with the edging. Edging: Rnd 1: Now working down side of piece, (2 sc around stem of dc, sc in side of sc) to bottom edge, (sc in ch-1 sp, sc in sc) across, working up side of piece, (2 sc around stem of dc, sc in side of sc) to top edge, (sc in ch-1 sp, sc in sc) across. Join with a sl st to first sc. Fasten off. (2 dc, ch2) 4 times. Join with a sl st to top of beg ch-4. (5 shells). Rnd 2: Sl st across to ch-2 sp, (ch 3, dc, ch 2, 2 dc), in each of next four ch-2 sps, work, (2 dc, ch 2, 2 dc), join to top of beg ch-3. Rnd 3: Sl St across to ch-2 sp, (ch 3, dc, ch 2, 2 dc), in the skip next two dc, *in the sp before the next two dc, work, 2 dc, in the ch 2 sp work, (2 dc, ch 2, 2 dc), rep from * around. Join with a sl st to top of beg ch-3. Row 4: (Bib) Sl St across to ch-2 sp, ch 4 (counts as a dc, ch 1), dc in ch-2 sp, ch 1, skip next dc, dc in next dc. (3 dcs separated by 2 ch-1 sps) Turn. Row 5-6: Ch 4, dc in next dc, ch 1, dc in last dc. Turn. Row 7: Ch 12, join with a sl st to first dc to form a ring. Fasten off. Tie: With rem yarn, chain a length of 18 inches. Fasten off. Weave through spaces below bib. Slip 12-ch ring around detergent bottle cap and tie a bow around the bottle.